It shouldn’t be a challenge to wear leather jackets without the stereotypical look of a biker chick. Not that there’s anything wrong with looking like a biker girl. 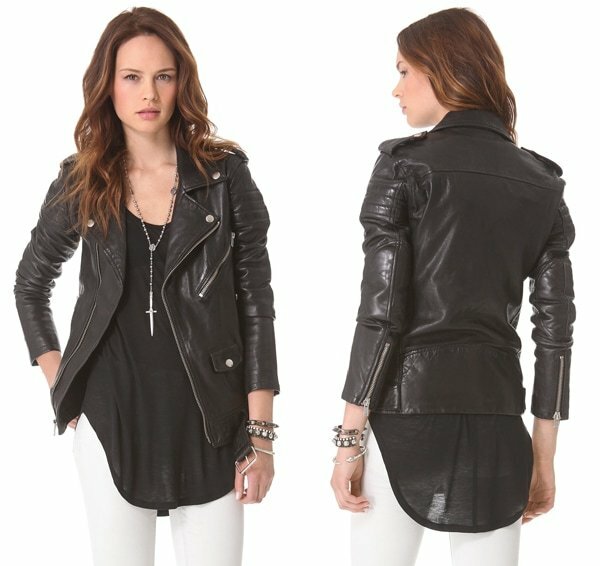 If your style leans more toward tough leather ensembles, go for it! Own it! But this succinct how-to guide is for those who want to sample the leather jacket trend sans that kind of aesthetic. Below are some bloggers who incorporated leather jackets into their more feminine ensembles. A striking bold-printed summer maxi dress offers a unique contrast to the toughness of leather pieces. Take it from Maggie’s ensemble. Her excellent fashion blog, ‘Clothes to Midnight’, is unfortunately no longer available online. Colorful prints will help balance out the ruggedness of your leather jacket. What’s the easiest way to make leather pieces look more feminine? We say wear it with bright colors! 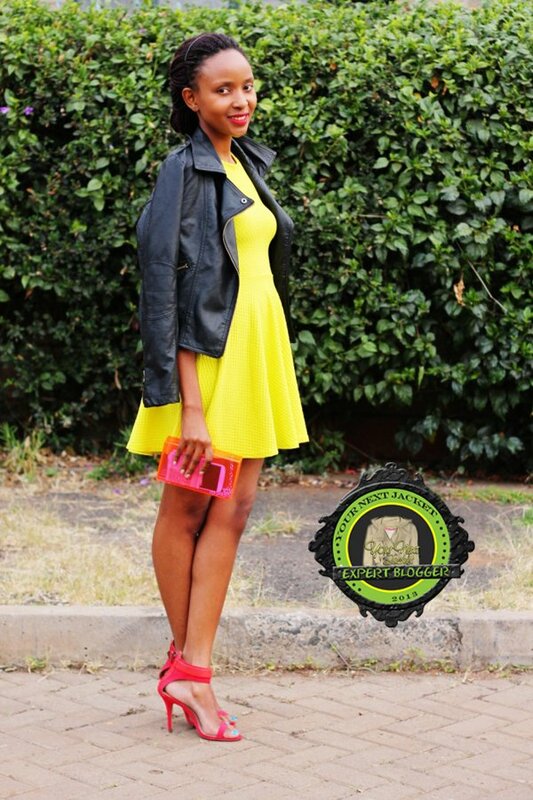 Nancie’s summery frock in neon yellow stands out against her black leather jacket. Her blog is unfortunately no longer available online. Don’t be afraid to wear leather paired with other black pieces. If you choose soft, billowy, and flattering pieces, you’ll pull it off quite nicely and you’ll look like a million bucks. Estefania did so in this outfit. She wore her jacket with a slitted maxi skirt, a simple top, and black loafers. We also like how comfy this outfit looks. Her blog is unfortunately no longer available online. You can’t go wrong with leather and lace. You just can’t. The contrast of feminine and masculine is interesting. Try something like what Nancy wore. It has a bit of bohemian vibe to it, don’t you agree? 5. Got an origami skirt? Pair that with your jacket! If you are a huge fan of the origami skirt, why don’t you try matching it with your leather outerwear? This creates an edgy ensemble that will have heads turning your way. Romina’s outfit is a nice inspiration. She even has on an ombre button-down top for extra spice. Loose-waisted dresses, ’60s-inspired frocks, and even ’40s-style tea dresses should work great with this kind of jacket. Check out this outfit by Style Peaches. We love her lavender gingham dress worn with a leather jacket. 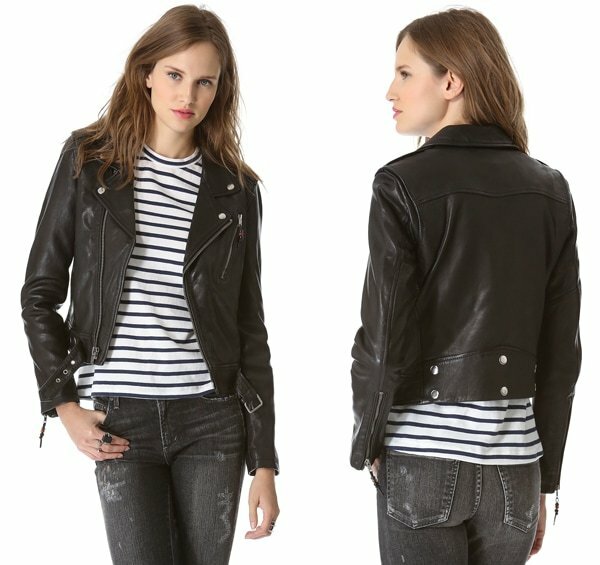 Well I personally believe that womens dont look cool in leather jackets but after going through these pics womens do look cool in leather jackets I would recommend them to wear Captain Marvel Jacket and upload some pics in the new blog. NICE ARTICLE REALLY I LIKE IT VERY INFORMATIVE FOR US THANKS ALOT .